NEW YORK, Feb. 27, 2018 /PRNewswire/ — Research confirms what many have long known: only when a person’s purpose for going to work shifts—from what he or she gets to what he or she gives through it—can that person ever enjoy a deep sense of personal or professional fulfillment. 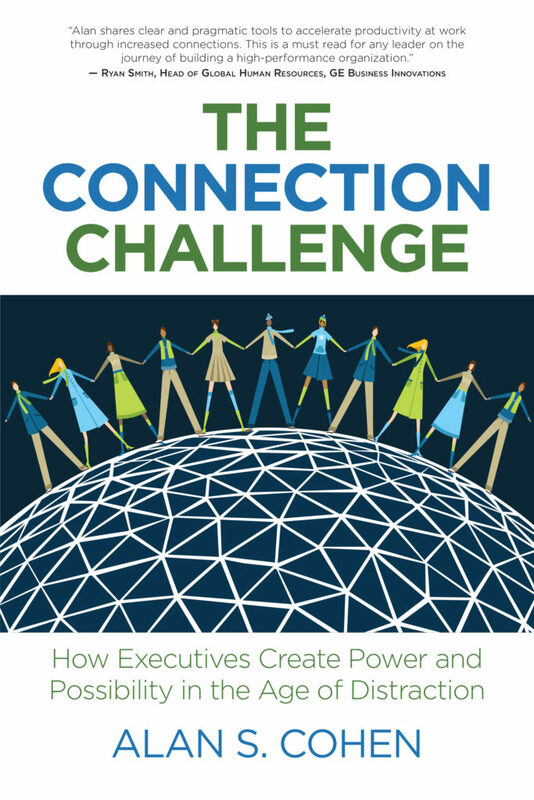 “Studies show purpose-driven people are four times more likely to be engaged at work, 50 percent more likely to be a leader, and have 64 percent higher levels of career satisfaction,” says Alan S. Cohen, author of the book “The Connection Challenge: How Executives Create Power and Possibility in the Age of Distraction” (2018, Indie Books International). “Executives with purpose earn higher incomes and have a higher average net worth, enjoy 42 percent more contentment overall, and live up to seven years longer,” says Cohen. Cohen is a transformational executive leadership coach, corporate trainer, and professional speaker. Notable clients have included MetLife, NBC/Bravo, Bloomberg and Edelman Public Relations. Before becoming a professional coach in 2007, he worked for 25 years in marketing and human resources. Most notably, he was Scholastic Inc.’s director of marketing, leading the team that promoted the acclaimed Harry Potter book series. Identify Your Top Five Core Values. What are your non-negotiable, the things you would leave a job or relationship over if not honored? For example, integrity, honesty, humor, compassion, excellence, aesthetics, autonomy, or balance. Identify Your Success Patterns. Who are you when you are at your best? For example, making presentations, closing deals, influencing others. Think about three occasions during which you felt deeply satisfied with a specific accomplishment and summarize them as brief stories. What do these stories say about who you are? Determine How You Affect Others. Go back to your success stories. What impact did you have on other people? How did you experience a sense of connection? What was important to you? Tap into Your Passions. What are you most passionate about? What lights you up? What is it about these passions that you love? Decide How You Are Unique. Write five sentences about how you are truly special. Figure Out What You Do Naturally. Write five sentences describing things that you do naturally. Write Up Your Statement of Purpose. This is a statement that demonstrates who you really are, and how you show up in life when feeling the greatest sense of connection. Think about your top values. Think about your passions. Think about how you are unique and what you do naturally. According to Cohen, there is another plus to purpose: purpose-driven people are drawn to work for purpose-driven companies and hire purpose-driven employees. Many businesses believe that having a well-integrated corporate purpose, rather than maximizing shareholder value, holds the key to success, according to new research from Ernst & Young, reported in a Harvard Business Review article.